Cold Spots #2 is out 9/26. 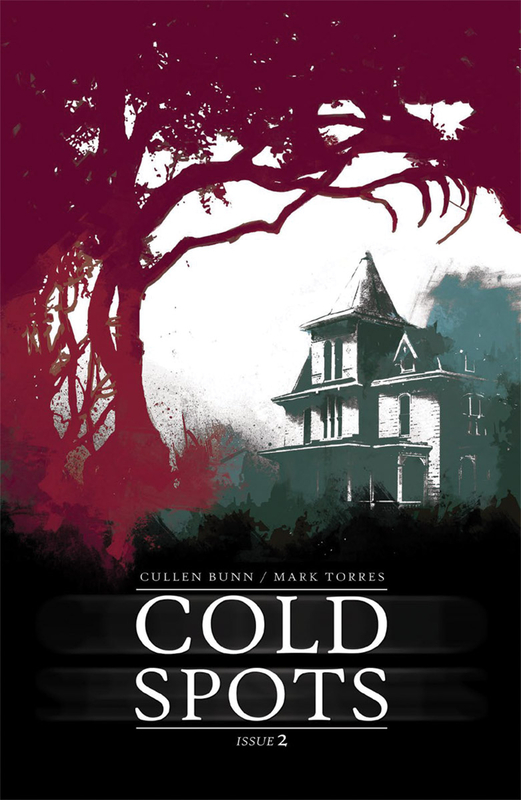 By Bo Stewart — In just two issues, Cullen Bunn and Mark Torres have firmly established the eerie atmosphere of Cold Spots. Everything in this comic simply feels cold. The colors invoke moods of winter, the characters are distant and evasive, and, of course, ghosts linger in the background, ramping up the creepiness. While I am interested in the larger narrative, the real draw of Cold Spots for me is this spine-chilling ambiance. If you’re a fan of stories like The Shining, Insomnia, or Shutter Island, you should definitely be reading this comic. Every scene is littered with unease, and Bunn expertly builds tension before each major scare. At its heart, Cold Spots is a ghost story, one with infrequent use of the ghosts that makes their eventual appearance more effective. Both of the splash pages with ghosts in this issue haunted me for hours, long after I’d put the comic down. If that’s not effective storytelling, I don’t know what is. It’s also worth mentioning that the ghosts’ designs are frightening and well-imagined. The unease of the atmosphere also extends to the characters, and Bunn gives us plenty of reason to doubt their motivations. Everyone has a hidden agenda or secrets to protect or both. The main protagonist, private investigator Dan Kerr, is no exception. One of the major reveals of this issue is that Grace, the girl Kerr has been hired to locate, is in fact his daughter. Grace’s role in the unnatural cold will be one of the big mysteries of the arc. I have always been a sucker for stories that use creepy kids effectively, and Grace certainly fits that bill. Torres’ visuals perfectly compliment the script, doing a lot of the heavy lifting in this issue. The gothic setting is gorgeously rendered with the scenes on Quarrels’ Island being a stand out. We are told that it is the dead of summer but the art exudes cold feelings of winter. This adds to the general sense of unease and disconnect. Even if you can’t see the ghosts, on page, you can feel their presence lingering just off panel. This is storytelling through atmosphere at its best. Unlike a lot of horror comics that use gore and shock values as the foundation for their scares, Cold Spots instead finds value in leaving much of the story unexplained. We don’t know where these ghosts are from, we don’t know what their intentions are. Hell… we don’t even really know what they look like. It feels as if anything can happen at any moment. Bunn and Torres lean on tension, atmosphere, and the unexplained to build horror. This is a slower burn, but I have every inclination that the real scares are just getting started. Bo grinds for the man by day so he can create comics by night. He is the lesser half of the Stewart Brothers writing team and can be found on Twitter and Instagram @stewart_bros. Bone Parish #3 is out 9/26. By Bo Stewart — Cullen Bunn is one of the best horror writers in comics. He excels at creating horrific scenarios, using touches of both the surreal as well as the ordinary. One of the best things about Bone Parish’s premise is that it allows Bunn to engage readers on both of those levels. We see surreal horror through the hallucinogenic properties of Ash (the drug at the story’s core), and we also see the more traditional, real-life horrors that led the Winter family to pursue drug production. Bone Parish #3 further examines these everyday horrors, showing how out of their league the Winter family has truly become. A power struggle at the top continues to ail the Winters. The thing is, neither Grace (matriarch and current leader) nor her underboss/son Brae are particularly up to the task of running the family business. Grace’s loneliness leads her to seek attention in destructive ways. She abuses Ash, which allows her to relive the companionship provided to her by her deceased husband, while at the same time she is also romantically courting a would-be buyer of their operation. Brae, meanwhile, excels at running day-to-day operations but foolishly shares trade secrets with an untrustworthy cop. Both Grace and Brae want to run the family business, but neither appear to have the acumen to run it effectively. With the cartel breathing down their necks, the Winters are starting to see exactly how steep the cost for maintaining control of Ash will be. It’s a great predicament, one that’s really driving this series forward. Problems with the business of the drug trade aside, in Bone Parish #3 we also start to see that no one truly understands the drug Ash itself. As we saw in #1, Ash is mysterious, capable of duplicating the life events of the dead. But what if Ash can also show us the thoughts of the living? As the drug’s creator, Lucien, says, what we do here…will give us control over both life and death. We can live forever. Our protagonists the Winters, however, don’t understand the potential of what they’re selling, and they stand to pay a steep price for their ignorance. 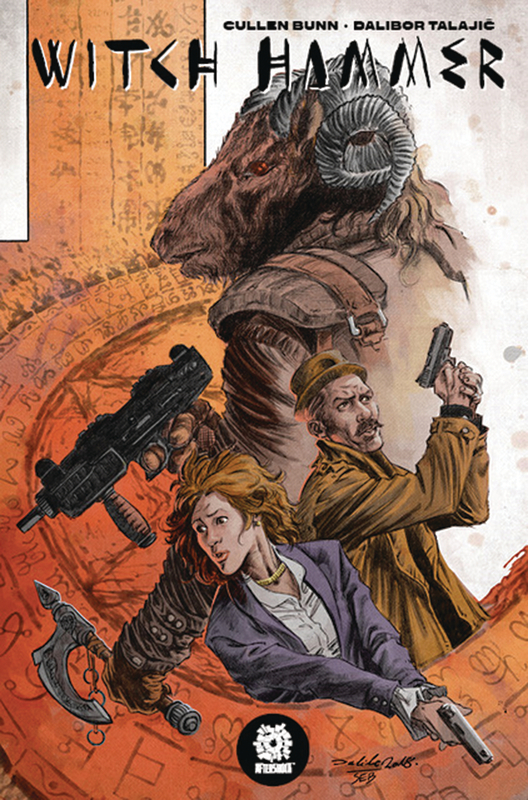 This is a good place to mention the expert coloring from Alex Guimaraes. Most of the New Orleans setting in this book is colored with shades of green that lend an uneasy vibe to the Big Easy setting. The scenes where a character is abusing Ash utilize an alluring color palette of blues and purples. The end result is a simple message: Ash, good…real world, bad. Ash is selling at a rapid rate and the coloring helps inform why that’s the case by conveying how it makes its users feel. We haven’t had a truly terrifying image since Winter Family dealer, Dante, was eaten alive during a bad Ash trip. But every panel in Bone Parish #3 is littered with tension as the stakes continue to rise with each issue. The tight linework from Jonas Scharf is crucial in making those stakes feel compelling and real. Cold Spots #1 is out Aug. 22, 2018. By Zack Quaintance — Cullen Bunn is prolifically establishing himself as comics’ foremost purveyor of horror, and Cold Spots #1 is another title likely to bolster that reputation. In this opening issue, Bunn takes a minimalist approach to introducing characters and exposition, using a few small exchanges and revelations to hint at larger backstories. For the most part, this first issue concerns itself with ambiance, as well as with enabling Mark Torres’ artwork to really shine. Although, shine is probably the wrong word for linework as alternatingly foreboding and forlorn as we get here. Simply put, Torres’ art in Cold Spots is beautiful, perfect for this story. The highlight of all of it is the use of color. Afternoons in rural locales, late nights in cities, even rooms for individual meetings—they all get their own palettes, palettes that go a long way toward influencing how the scenes in Cold Spots read and feel. There’s even a scene wherein color shifts based on a character’s (questionable) decision. It’s absolutely fantastic work from Torres. The setting is also an interesting facet of Cold Spots. Between this book and other recent work (thinking specifically of Bone Parish with Boom! Studios), Bunn continues to tell stories about less-heralded regions of the United States, regions often ignored by television shows and movies,where problems in real life have made them ideal for explorations of the supernatural and occult, beset as they are by job loss and our worsening national opioid crisis (which, to be fair, is a problem everywhere). Anyway, Bunn has tapped into this as of late to emphasize the gothic qualities of places that range from Louisiana to the heartlands to (as in this story) North Carolina, telling tales of phantoms and wispy ghouls and the undead. Cold Spots #1 is in the end a pretty and spry read, one that tears through its opening chapter while doling just enough exposition to further its mystery. The characters are shallow-yet-believable so far, letting the creative team provide a fantastic hook for readers along with a set of stunning and scary artwork. This is ultimately a five-part series, and I’d be surprised if the vast majority of folks who pick up #1 don’t end up sticking around for the duration.